One of the favourite teams to win this year's Trans-Baviaans challenge, a gruelling mountain bike race over 230 km, transitioned a sure podium-position away last weekend when they spent too much time in transitions socialising, eating and sleeping. The team spent about the same amount of time at checkpoints, as other teams took to finish the whole race, reports our correspondent from the Eastern Cape. Team Dark & Dirty, who entered their third team due to all kinds of excuses from the first and second teams, were the favourites to win the competition, mainly because of all the publicity that their small & loony group of writers, riders and photographers enjoyed over the last few months. The transitionally challenged team started the race with a mad sprint over the flattish and sometimes even downhill-part of the route. Jan Dekker was seen spinning like a yo-yo at a cadence approaching 300 revs per minute to keep up with team captain Hans Wolfaardt's crazy pace. Team Dark & Dirty were among the first 50 teams to arrive at checkpoint 1. 'I went quite fast', was all that Dekker had to say as he tucked into the hotdogs and coffee provided at the checkpoint. No team could overtake Team Dark & Dirty when they were on their bicycles, averaging about 19 km/h over the total distance. Speed and fame, unfortunately, were not enough to win them glory, the team found out in the early hours of Sunday morning. 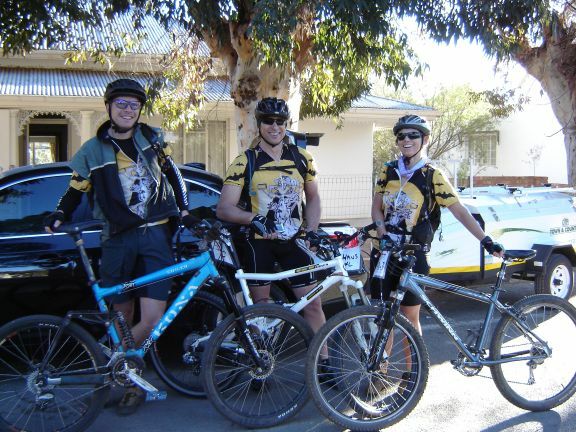 The team's original goal was to finish in 20 hours, and ahead of team Bloukous and Team Brother-In-Law. The tailwind and dry weather made for perfect riding conditions, and it soon became clear that neither the 20 hours, nor any other team (with a teamname starting with B) posed any threat to the Dark goals of the Dirty team. From the first checkpoint, the team were a clear favourite among the checkpoint-staff, opposition team support teams, and paramedics. A paramedic at checkpoint 4 ascribed the team's popularity to the fact that they stopped and socialised with everyone at every checkpoint, instead of just racing past like other teams of their calibre. Team Dark & Dirty stayed in the first transition for more hotdogs, more coffee, and then sat down watching teams come and go, lubing their bums, lubing their bicycles, and thinking up all kinds of other excuses to postpone leaving the checkpoint. When they finally did leave, it was a mad dash to catch up with teams that passed them while they were transitioning. By the second transition the pattern of 'cycle hard, transition hard' that the team would follow through-out the race, was already firmly established. The hardtail-unfriendly surface, freeride-bike-unfriendly hills, long fun downhills, more long fun downhills, gruesome climbs and stealth-mode riding by starlight, all contributed to the sore bums that would haunt the team from the first checkpoint. Dekker almost caused a riot in the team when he suggested that the reason for sore bums might be too much chocolate brownies. When the race-pace became too hot on one of the rare occasions that the team could be found actually ON their bicycles, Carine Reyneke tried to wear her team mates out by discovering a puncture right at the top of a downhill, causing the ever-energetic team mates who waited in vain at the bottom, to climb the hill again to come to her aid. When that didn't seem to slow the team down, she tried an old trick by breaking her seat post. Dark & Dirty Dispatch Readers will remember that she tried that very same trick a few months ago during the Sabie Shenanigans, causing Dekker much pain and grief to try and fix it, while she was taking a much-needed rest. This time, however, Dekker was ready for the onslaught: no sooner had the team been made aware of the broken saddle, or he was found lying sleeping next to the road, with gloves tucked in on both sides of his helmet to shut out lights from passing cars and bicycles, leaving Wolfaardt to take care of the mechanical breakdown. Official investigations are still underway, but a preliminary report reveals several possible reasons for the long transitions that costed the team their race. The perfect weather could have played a role in the team's reluctance to get out of the watering holes. 'In foul weather, a team might want to get on their bicycles and get the race over with, but the sunshine & tailwind might have reminded the cyclists of lazy Sunday-afternoons on thick grass under big trees', a paramedic explained. Wolfaardt blamed the transition-disability on the changed menus. Racers were promised boring potatoes, but were offered braaivleis, potato salad and sosaties instead. At another transition they were promised coffee, but got harassed with cream-and-syrup-spiked hot chocolate, chocolate muffins and garlic rolls. 'I mean, what was the organiser thinking - it was more like a spud-crawl than a cycle-race', Wolfaardt was heard muttering to his team mates. 'How did the race organisers expect us to cycle after that? Being all sleepy like after a Sunday lunch & everything?' Official complaints will be lodged with the race organiser. At checkpoint 6, the team finally found a way to keep Dekker from falling asleep at transitions when Wolfaardt devised a cunning plan that involved getting an innocent bystander to admire Dekker's bicycle and start discussing freeriding. This plan, however, also had its challenges, because neither Dekker nor the innocent bystander was prepared to leave the checkpoint before the necessary exchange of contact details. Wolfaardt calculated that the team could change the 24-hour-event into a staged race by combining the time spent at each transition, and rather make a proper transition-area out of one of the transitions. 'We could pitch tents and sleep in proper sleeping bags', Wolfaardt proposed excitedly. Fears now exist that other teams will catch on with this trend, changing the Trans Baviaans into a multi-staged event and thereby robbing if of its status as the world's longest single-stage race. One possible reason for Dekker's reluctance to wake up and get onto his bicycle after checkpoints was discovered after the race when Reyneke tried to move Dekker's backpack. It weighed about 70 kg's and help had to be called in to move the pack 2 metres to make space to sit. Dekker was not available for comment.